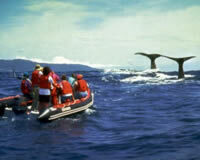 Six meter long rigid hull inflatables are used, allowing for safe and fast access to the whales and dolphins. The boat size does not disturb the mammals. Using the original look-out system called "Vigia", a surveyor observes the sea, with the help of binoculars, on the lookout for cetaceans. 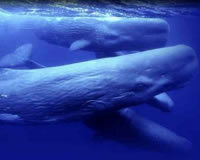 The Sperm Whales, the largest and most numerous in these waters are readily identified throughout photographs taken of the undersides of their flukes when diving. The other toothed whales frequently sighted are Northern Bottlenose Whales, Pilot Whales, Orcas and Sowerby's Beaked Whales. The dolphins sighted regularly in these waters are Common Atlantic Bottlenose, Risso, Atlantic Spotted and Striped. This program is designed for active people in good physical heath, able to swim and with a spirit of adventure and love for nature. We offer a 7 night package at the village of Lajes on Pico but the individual departures can be done from any of the three islands. 7 nights and 8 days at the villa of Lajes, Pico Island. At Lodge Talasa, located in the center of the village of Lajes, within 2 minutes from the harbor. It's a clean family pension. All rooms have private bath and most have a sea view.